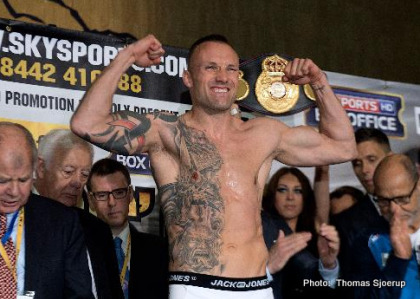 By Scott Gilfoid: Former WBA/WBC super middleweight champion Mikkel Kessler (46-3, 35 KOs) is reportedly coming out of his 4-year retirement to take part in a tournament called “World Boxing Super Series,” according to Bt.dk. There is a press conference that is said to be taking place to discuss Kessler’s comeback. With Kessler coming out of retirement, it’ll be interesting if this lures Carl Froch to come out of retirement to try and get a third fight with him. Froch would likely take boatloads of criticism if he faces Kessler a third time, because he’s not shown interest in facing unbeaten Gennady Golovkin despite the big money he could make in that fight. Kessler, now 38-years-old, hasn’t fought since losing to Carl Froch by a 12 round unanimous decision on May 25, 2013. For those who saw that fight, they remember how Kessler appeared to put in very little effort in the first 6 rounds, as he stayed on the outside, as if he was confused by Froch’s constant flicking jab, which looked very, very weak. When Kessler finally started to attack Froch in the 2nd half of the fight, he dominated him just like he had in their first fight in 2010. Froch looked just as clueless as he had in the first fight. Fortunately for Froch, he had built up such a wide lead in the first half of the fight that he was able to milk the lead to get a 12 round decision. But in watching that fight, I have no doubts in my mind that Kessler would have whipped Froch if he’d fought hard for the full 12 rounds instead of just the last 6. Kessler stopped fighting after the Froch rematch. It’s unknown why Kessler is coming back to boxing after all these years. Could it be the lure of sweet cash that’s bringing Kessler back to the sport? According to Bt.dk, the prices for the World Boxing Super Series is “not less than $50 million dollars – or roughly 350 million kroner.” If Kessler can get that kind of money in his comeback, then it makes sense for him to be making a comeback. Kessler could make a ton of money if he’s successful. The World Boxing Super Series reportedly will involve 16 boxers and will take place between September and May. I haven’t heard much about the tournament, but if it takes place, it’s going to be a good deal potentially for Kessler if he can come out on top. At 38, Kessler might not have much left in the tank. He’s been out of the ring for 4 years, and there’s obviously going to be a ton of ring rust. If Kessler has to fight often, he could break down physically with injuries. Kessler didn’t make it through the Super Six tournament in one piece 7 years ago in 2010. He was injured in his first fight with Froch in 2010, which kept Kessler out of the ring for over a year. Kessler didn’t fight again until June 2011 in beating Mehdi Boudla by a 6th round knockout. Kessler then beat Allan Green and Brian Magee before losing to Froch in a rematch in 2013. Kessler appeared to still have a lot in the tank in 2013, but he didn’t fight Froch like he was motivated.